Alabama signee Riley Norris (#2 in the photo) from Albertville turned in an outstanding all-around game to help Alabama’s boys defeat Mississippi for the third straight year in the 24th annual Alabama-Mississippi All-Star Basketball Game played Friday night at Jackson State University’s Lee Williams Athletics Assembly Center. The box score shows that Norris had 16 points on 4 of 9 shooting, 2 of 6 from 3pt range. He was also 6 of 11 from the FT line....not so good. However, he pulled down 9 rebounds and had 3 assists. 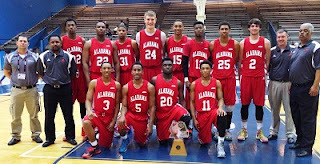 Alabama's other in-state signee, Justin Coleman, was not on the Alabama roster for this game. The star of the game was Kentucky signee Devin Booker from the Mississippi team, a 6-6 guard, with 31 points, a record for the AL-MS series.